Published on July 3, 2014 by Martyn. Be the first to comment! 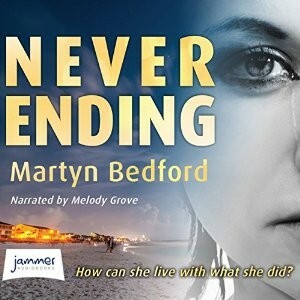 I’m delighted to announce that a UK audiobook of Never Ending has been released this week, under the Jammer imprint of one of the country’s leading audio, digital and large-print publishers, W.F. Howes. It’s an unabridged edition with a run-time of 8hrs 56min, narrated by the talented young actor Melody Grove, who has a number of stage, screen and radio roles to her credit. Click here to view the audiobook’s Amazon page.